Quite a lot of people have already come upon some advertisements that feature a product named Global Test Market. So what is it? Is it anything more than another scam run by some money grabbing imposter? The short answer is, no. Continue through the review to find out all there is to know about Global Test Market. If you’re looking for a legit way to make money then check out my review – income proof here. Global Test Market is an online survey service that allows you to participate in reviewing one product or another. Product does not mean only consumable products like the latest offer of KFC or a new tool kit introduced by some famous company. You can choose from quite a wide array of surveys that include movies, restaurant, automobiles, current events and pretty much any topic that you might find interesting. Why use Global Test Market’s surveys? So why use Global Test Market surveys when there are equally good survey sites available like Opinion Outpost, Inboxdollars and Panda Research? The answer is simple. They pay you for your effort. For each survey you complete, you account is credited with a specific amount of points. When you accumulate 1000 points (known as MarketPoints) you can cash it for $50 (for each point you earn about $0.05). There is no loophole in this and actually is as simple as it sounds. There are multiple methods for redeeming your MarketPoints. Like, for each 1000 points you could ask for a $50 cheque or you could ask for a payment of $20 to your PayPal account for each 460 points or ask for gift cards and e-vouchers. 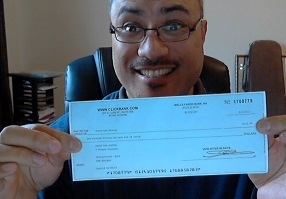 The cheques are mailed to the mailing address you decide to put in. Now that the most important questions have been answered, one would wonder, what are these surveys good for anyway? Global Test Market is responsible for these surveys on behalf of quite a few famous brand names. Their list does not include only big names, however. Various companies need to know how a product of theirs is doing in the market or how a product would do once it has been introduced for the first time. They need to acquire feedback about existing products and suggestions and potential niches for a new one. And all these surveys are for that purpose alone, acquiring information for those businesses otherwise known as business research. This is what Global Test Market does and those businesses are their clients. There have been a few questions about the genuinity of Global Test Market, asking whether it is a scam. Currently, there are about 5.5 million members of GTM in 49 countries. Anyone who has participated in any of their surveys would assure you that it is not a scam. They do not ask for any kind of payment when you sign up. It is free and the only monetary transaction that you need to bear i mind is the payment that you receive. This is how you can tell whether a product/service like this is a scam. Genuine online surveys do not ask for money when it is they who are actually receiving the information. Keeping all these in mind, it is always better to go through both the pros and cons of a product. Undoubtedly, Global Test Market being completely genuine is its best part as it is advantageous for the participant. Consumers from 49 countries can participate. The age restriction is very limited. Anyone over 13 years of age can become a full member. Participants get to know about new products. The worst quality of Global Test Market is possibly their long respond period. Members do not get much of a response regarding when they will be able to participate in the surveys. It takes quite a few days before they send enough invitations to your inbox. It takes about 2/3 months for you to acquire 1000 MarketPoints. When of course it is easy money, it is also somewhat frustrating. Although it is mainly due to the lengthy respond period mentioned before. Truthfully, the general feedback about Global Test Market is positive. However, there have been a few highly negative reviews as well. Once in a while members complained about a few serious issues that could actually convince a member that it is indeed a scam. Some people have complained that Global Test Market has refused them payment even when they had the required points. Another issue is their time-inefficient status update. Sometimes when a participant finishes and submits a survey, they get a dialogue box informing them that the survey has already ended. This can get seriously irritating if you had to spend about an hour for that survey. However, these problems also occur due to various bugs or server issues so it is impossible to blame one party or another without any doubt. All in all, Global Test Market has managed to generate positive experience in general. Want to learn how to make real money online? Join Frank here. InBoxDollars Review – Is this program legit? Is SnagAJob.com Legit or a Scam? Wake Up Now – Is it A Scam? – Don’t Worry Go Back To Sleep. I reached more than 1000 points and they dont want to pay. Why do I know? Simple, since 3 days ago they closed access to my own account with a “bad certificate” denial of security. In plain words they dont allow access with my mail and password. Totally a scam. I agree. But when it comes to redemption, i doubt. I have not got my redemption yet, I applied almost 1 month back. I am waiting for my money to come into my account – they said 5 – 10 days and it is more. Should I wait? I emailed them twice and got no response at all. THEY TAKE YOU THROUGH ENTIRE SURVEYS FOR HOURS AND THEN SAY YOU ARE ELIGIBLE!!!! THE SURVEYS ARE BIAS. IF THEY DON’T LIKE YOUR HONEST ANSWER, THEY DON’T WANT YOU!!!!! EVERYONE MUST STOP SO THEY GET THE MESSAGE!!!!!! How do u really feel about the situation? Always hated such scams – taking your time and telling you that my profile or whatever didn’t match their profile. Just tried 3 of their surveys, good for nothing. Horrible site and most of the survey sites are like that. The only legit survey site I came across so far is Google opinion surveys. But their surveys come very rarely, and you can buy only digital content. I thought they were legit at first, even though slow to pay and the surveys were quite long. But, then, after spending hours completing surveys, I was getting messages at the end saying “Wow! Our records show that you have already completed this survey.” This was AFTER I get the message saying that I had completed the survey and get an exit survey. When I inquire, GTM says I was screened out of the surveys (about 1200 points worth!). I know when I have been screened out (usually after just a few questions or a few minutes) and when I spend over half an hour COMPLETING a survey. Especially when I get the message saying that I had completed the survey and get an exit survey. I have wasted enough time arguing this point with them. I think they just send canned responses to everyone and don’t even read the inquiries. I have wasted way too much time COMPLETING surveys with no compensation. Stay away unless you just have way too much free time on your hands. Is it really true that the payments take that long? I mean, I am new to the GTM business so I am curious to know if I should go on surveys and achieve points or not, Because it seems that a lot of people complain that when you complete the survey and then you get a number of points which you are supposed to get paid from, the payment doesn’t come, or at least, the businesses don’t reply or it takes a looong while for them to reply to your survey and achieve points. And I also ask that if the company that you are surveying doesn’t reply for a while, why don’t you just go to another business and survey them? and if they don’t reply, you repeat? Or maybe I am not getting it right. Can someone answer me these questions if they can? It is a SCAM!!! They send check that is not accepted, and when you try to do something about it, they tell you that it’s been too long and they no longer want to pay the check they issued. Funny how this article reviews this business as generally positive, yet there isn’t one positive remark here in the comments. I realize people are more likely to post negative experiences, and say little about positive ones. But that’s fair, because what we would apparently consider a positive experience, would be if this company simply met its bare minimum obligation to its participants. Its sad that we’re defining as positive, any experience in which a company doesn’t blatantly cheat us out of our time and effort. I suspect such companies could easily operate under one name for a while, selectively scam its reviewers, and when they’re tactics become known, start all over again with a new name.